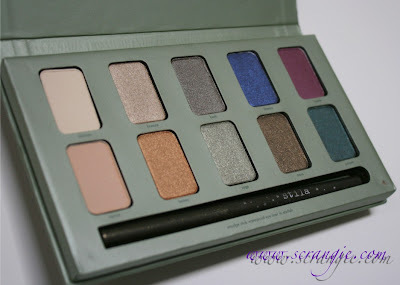 Picked up the new Stila In The Garden palette last week. 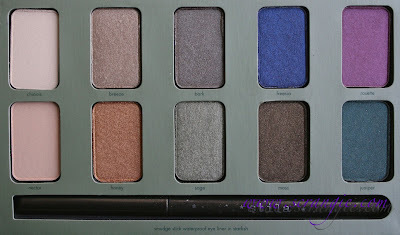 I really liked the NaturalEyes/Natural Eye/In The Light palette they did for fall last year, so I was hoping this new one would be just as nice. Turns out it is! Maybe even a little better. 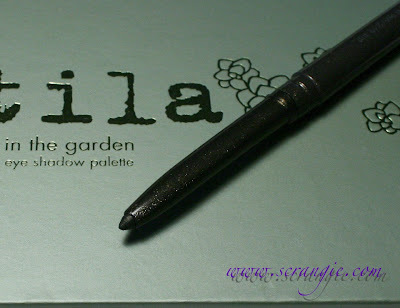 The Stila In The Garden palette is a set of ten shadows plus a full sized Smudge Stick eyeliner. The shadows are Chinois (matte creamy white), Breeze (shimmery beige), Bark (shimmery taupe), Freesia (shimmery violet blue), Rosette (metallic pink violet), Nectar (matte creamy beige), Honey (metallic bronze gold), Sage (shimmery translucent green), Moss (dark olive green with shimmer), and Juniper (deep shimmery forest green). 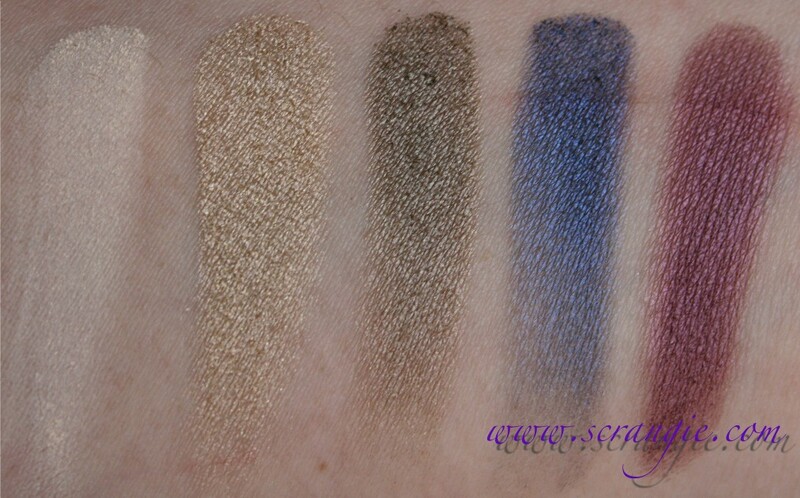 The Smudge Stick liner that comes with this palette is called Starfish. It's a smoky greenish-black with big chunky gold sparkles. 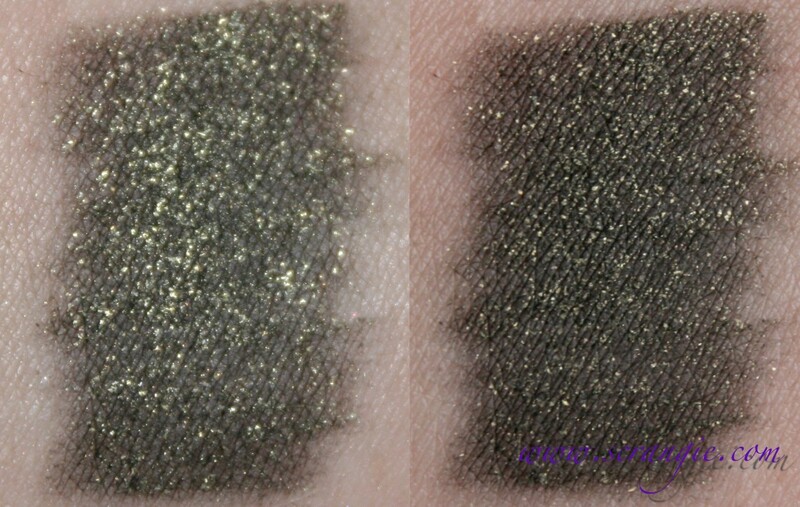 Closeups of the shadows, with flash and without. Please click to enlarge. Swatched over bare skin (no primer), with flash and without. Chinois , Breeze, Bark, Freesia, Rosette. Nectar, Honey, Sage, Moss, Juniper. 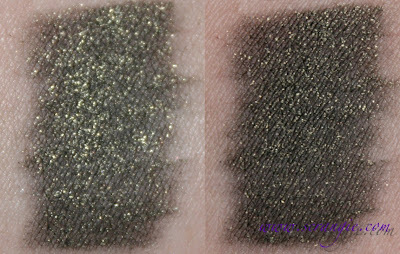 Stila Smudge Stick Eyeliner in Starfish. I don't know why I try to do winged liner with a pencil. I can never get it to turn out right. 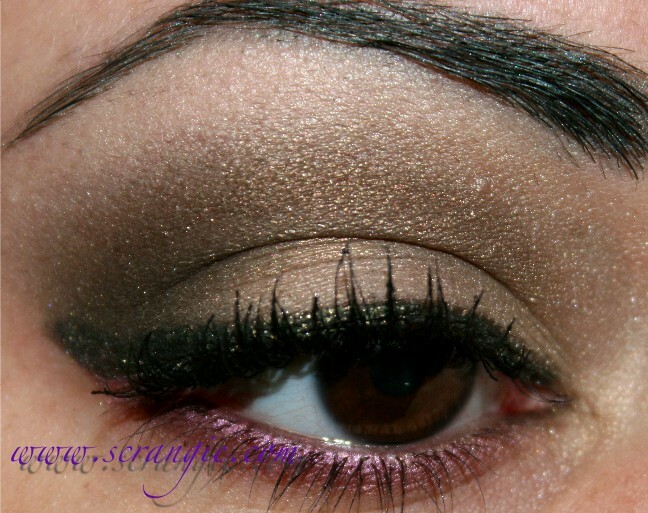 Besides the crappy liner application, the shadows looked great. They apply really smoothly and they smoke out perfectly. These shades were very easy to blend. Again with the pencil winged liner! It didn't turn out good at all. I'm kinda embarrassed to even post that picture because my liner is so bad, but the sparkles in Starfish showed up so well in the picture that I just had to put it up. Starfish isn't very pigmented and it's not as smooth as the other Smudge Sticks I've tried (Koi and Damsel), but the sparkles really do show up on the eye. These shadows applied just as nicely as the others, no problems at all. 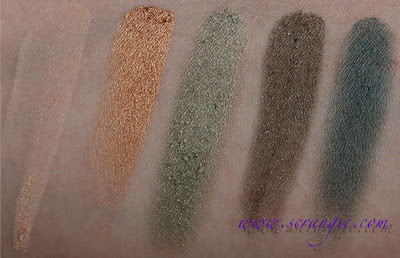 I like the color selection better than the brown-based NaturalEye/In The Light palette. Shadows were soft and smooth, not as powdery as the last palette. 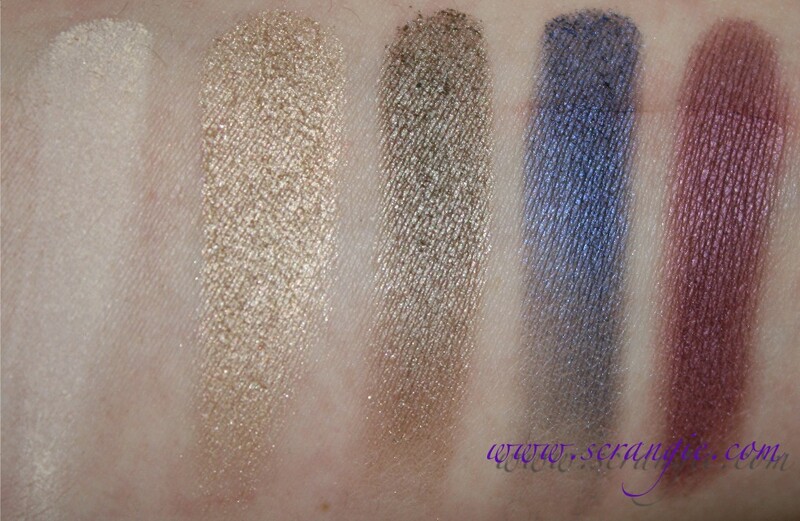 Pretty good pigmentation on all the shades that I tried. Perfectly suited for smoky eye looks. 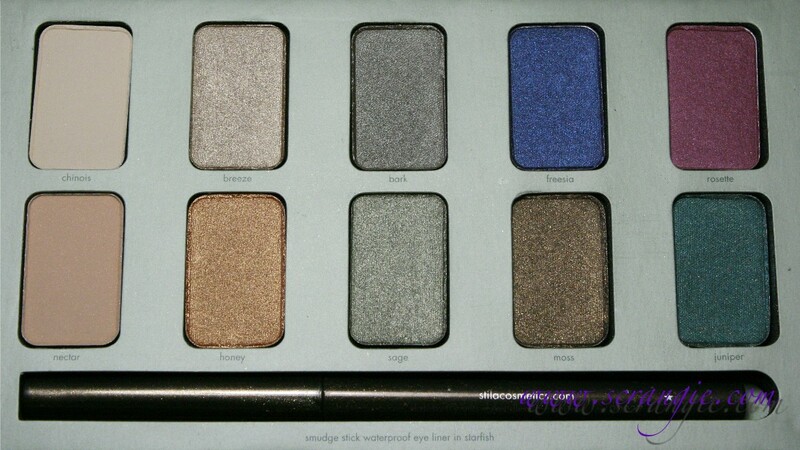 These shades smudge and smoke out very well. Comes with a full sized liner. 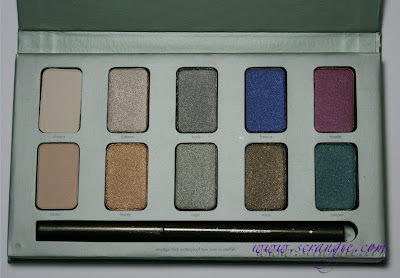 Magnetic closure on the front of the palette. 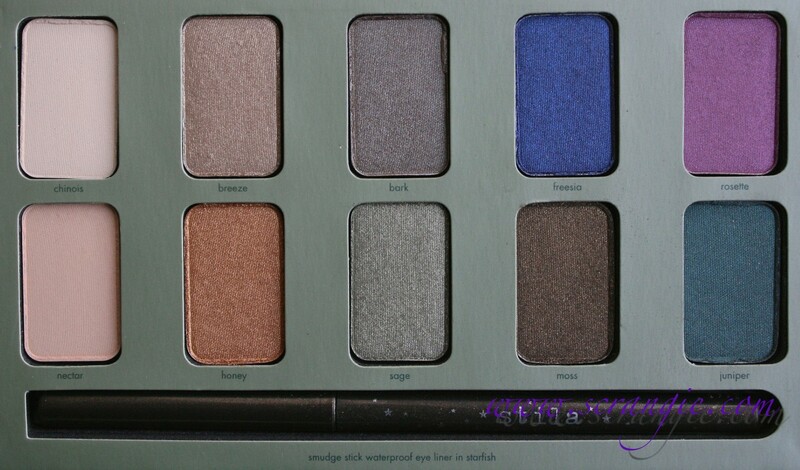 This palette doesn't contain Kitten eyeshadow! Glad to not have another duplicate color. The Starfish liner felt dry and didn't have very good payoff. It wasn't smooth and creamy like the other Smudge Stick liners I've tried. It tugged when I applied it and I had to go over my line multiple times to build an opaque line. Smudge Stick liner doesn't retract. If you twist it up too far, you're pretty much screwed. Be careful not to twist up more than you need to line your eye. A lot of the colors are frosty. Not really the most exciting color selection. Looked more vibrant online. This reminds me a bit of another one of my favorite palettes, the Wet n Wild Comfort Zone Color Icon palette. They're not dupes of each other, but the theme and a lot of the colors are similar. When I want smoky, green-based earth tones, that's usually my go to palette, so that's probably why I liked the colors of this one so much. I do wish that the colors weren't so smoky and dull, though. With a name like "In The Garden" I was thinking they'd be a little more fresh and leafy. Maybe it's really supposed to be "In The Garden in February." :) Overall, though, I'm happy with the quality of the shadows and the size of the palette. These Stila palettes stack really nicely and don't take up much room even though there's ten big shadows and a full sized liner it them. 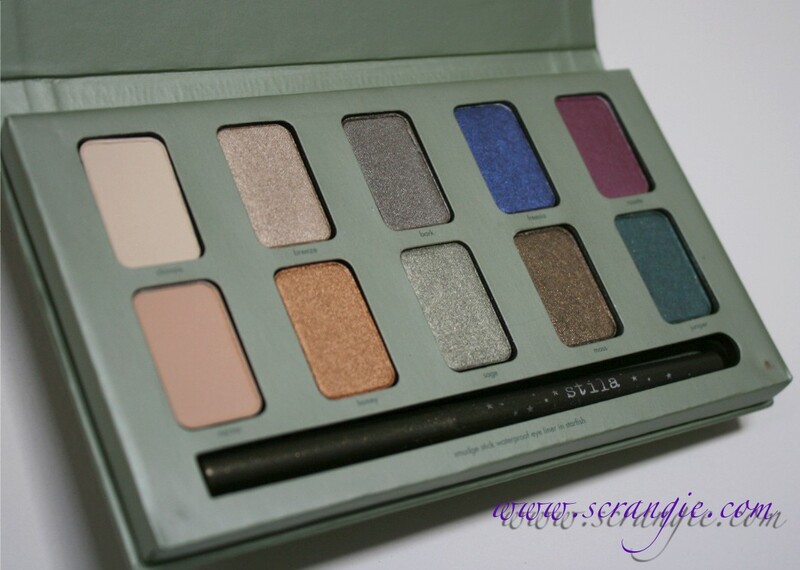 I ordered mine from Stila's website, but Sephora has this too. $39 and it is not limited edition. I like the greens in this one a lot. I laughed when you were talking about the pencil liner wing as I was totally trying to do one yesterday using the Pixi toasted set you posted about a bit back and failed so bad. It came out like your more neural look, but way worse. There was no point to my wing, just a blob. Amazing colors!! 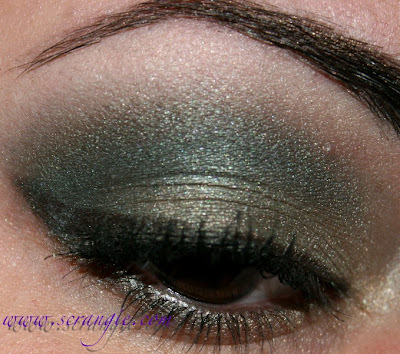 Great tones to every kind of look, very impressive. I like this one a lot. Thanks for the swatches! 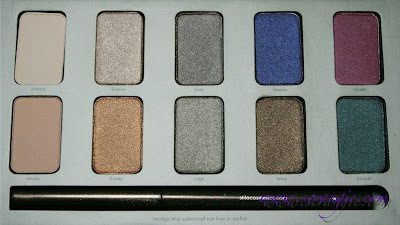 I actually quite like the colors in this palette, looks like a great set to throw in the bag when you have to travel. It's a shame about the liner though. Don't worry about the 'crappy' liner photos you've got, I've done worse! Haha. :) I love how your pics capture the colors well. Some pretty shades - but I have way too many eye shadows now - I have to clean out before I can buy any new ones - don't like that so many look frosty as you also said...Like you also, I cannot do a cat eye wing with a pencil either - I need my fav angle brush and a good gel liner or something I mix up on my own to really get it done right. I would have picked the same shades you did to do an eye 'do' with this first pass though! I am big of late putting in a touch of bright pink since getting UD's Woodstock 24/7! 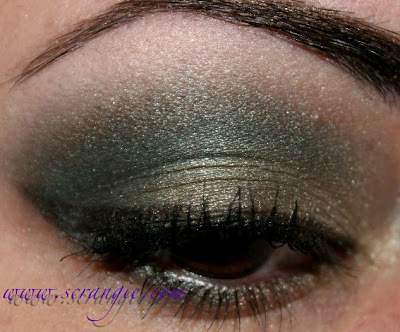 Love the greens in this palette. I'm hoping I can resist this! Love both makeup looks. Your always gorgeous!